MMTS train timings are train timings of mmts (Local trains) in Hyderabad and Secunderabad. MMTS is a Multi-Modal Transport System. It is one of the transport systems in Hyderabad and Secunderabad cities. It was started from August-2003 and run by the South Central Railway (SCR). The MMTS service covers a distance of 43 km and 26 Stations in twin city’s and running between Falaknuma to Lingampally, Falaknuma to Hyderabad, Hyderabad to Lingampally. There are First Class & General class compartments, vendor compartments and special Ladies compartment are available in MMTS trains. 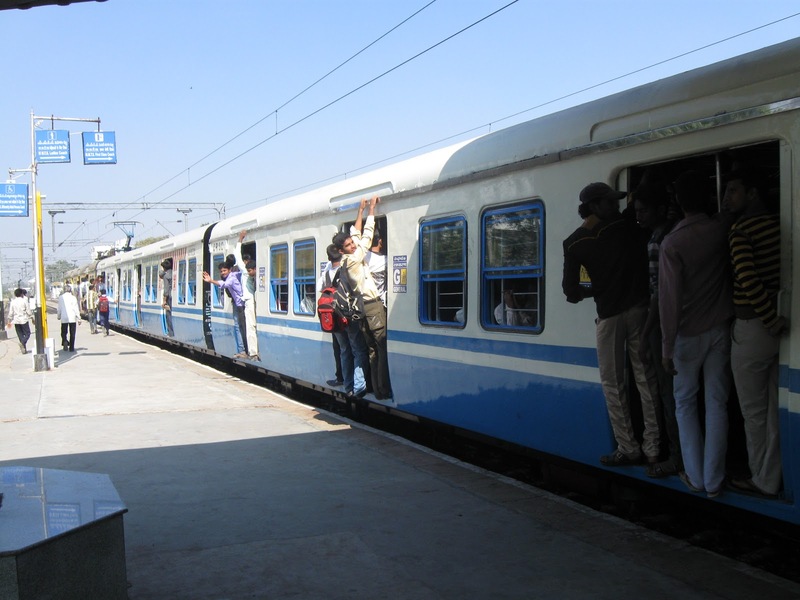 we are providing latest mmts train timings in this site and these mmts timings are Updated On 05-01-2019. All MMTS stations are computerized for issuing MMTS Tickets, General Tickets and Reservation counters also available. Recently SCR introduce the ATVM machines for MMTS & General tickets. These machines are available in Secunderabad, Hyderabad, Kachiguda and MMTS stations. The Railways gives the combined pass for APSRTC buses and MMTS. So buying a single pass will help in traveling by bus as well as the train. SCR provide the display boards at all mmts locations for mmts timings. It is very useful to all passenger to know the mmts timings. Suburban train service is available in Twin city's . They running between Secunderabad to Manoharabad, and cover 16 stations. It is very useful, whoever go to Alwal,Bolarum,Medchal. We are providing new mmts time table for Hyderabad and secunderabad city passengers in lingampally to hyderabad, lingampally to falaknuma, falaknuma to lingampally, falaknuma to hyderabad and hyderabad to falaknum mmts routes. Falaknuma to Lingampally Via, Huppuguda ,Yakutpura , Dabirpura , Malakpet , Kacheguda , Vidyanagar , Jamai Osmania , Arts College , Sitafalmandi , Secunderabad , James Street , Sanjeevaiah Park , Begumpet , Nature Cure Hospital , Fatehnagar , Bharatnagar Borabanda , Hitech City , Hafeezpet , Chandanagar . Lingampally to Falaknuma Via, Chandanagar , Hafeezpet , Hitech City , Borabanda , Bharatnagar , Fatehnagar , Nature Cure Hospital , Begumpet , Sanjeevaiah Park , James Street , Secunderabad , Sitafalmandi , Arts College , Jamai Osmania , Vidyanagar Kacheguda , Malakpet , Dabirpura , Yakutpura , Huppuguda . Falaknuma to Hyderabad Via, Huppuguda ,Yakutpura , Dabirpura , Malakpet , Kacheguda , Vidyanagar , Jamai Osmania , Arts College , Sitafalmandi , Secunderabad , James Street , Sanjeevaiah Park , Necklace Road , Khairatabad , Lakdi-Ka-Pul . Hyderabad to Falaknuma Via, Lakdi-Ka-Pul , Khairatabad , Necklace Road , Sanjeevaiah Park , James Street , Secunderabad , Sitafalmandi , Arts College , Jamai Osmania , Vidyanagar , Kacheguda , Malakpet , Dabirpura , Yakutpura , Huppuguda . Hyderabad to Lingampally Via, Lakdi-Ka-Pul , Khairatabad , Necklace Road , Begumpet , Nature Cure Hospital , Fatehnagar , Bharatnagar , Borabanda , Hitech City , Hafeezpet , Chandanagar . Lingampally to Hyderabad Via, Chandanagar , Hafeezpet , Hitech City , Borabanda , Bharatnagar , Fatehnagar , Nature Cure Hospital , Begumpet , Necklace Road , Khairatabad , Lakdi-Ka-Pul . Secunderabad to Manoharabad Via, Secunderabad , Lallguda Gate , Malkajgiri , Dayanandnagar , Safilguda , R.K. Puram , Ammuguda , Cavalry Barracks , Alwal , Bolarum Bazar , Bolarum , Gundla Pochampalli , Gowdavalli , Medchal , Dabilpur , Kuchavaram , Manoharabad . Manoharabad to Secunderabad Via, Manoharabad , Kuchavaram , Dabilpur , Medchal , Gowdavalli , Gundla Pochampalli Bolarum , Bolarum Bazar , Alwal , Cavalry Barracks , Ammuguda , R.K. Puram , Safilguda , Dayanandnagar , Malkajgiri , Lallguda Gate, Secunderabad.